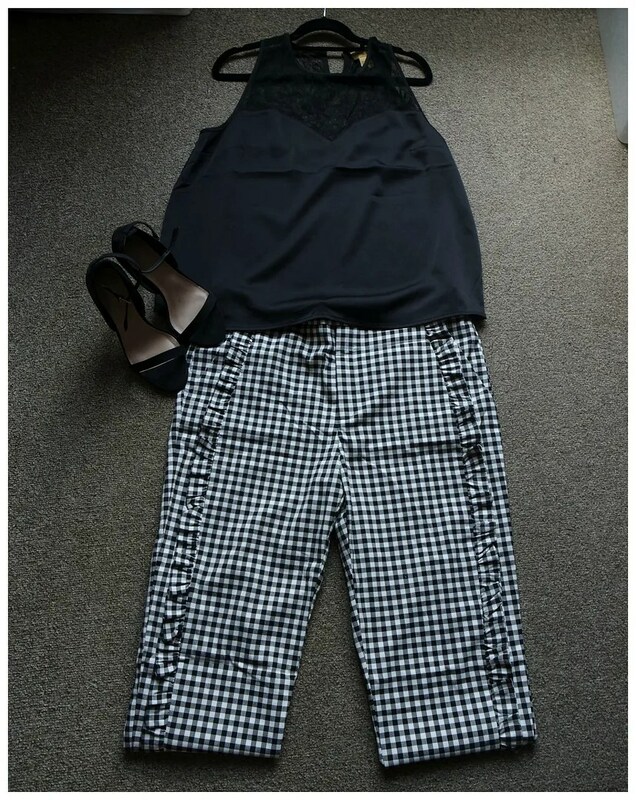 During last year’s summer sales, I purchased a pair of gingham trousers from ZARA. I thought it would be a perfect piece for spring, since it has a cute ruffle to the side of the legs. Now that it is spring, I figured it would be time to style it up. These are 5 outfits utilizing this slightly outrageous pair of pants. This first outfit I actually wore to work the other day. The pictures I took for this blog post inspired me. Goes to show that bloggers even provide themselves with inspirations. I did go in with a different shoe as it is still a tad too cold for bare ankles here. So I wore a bootie instead. 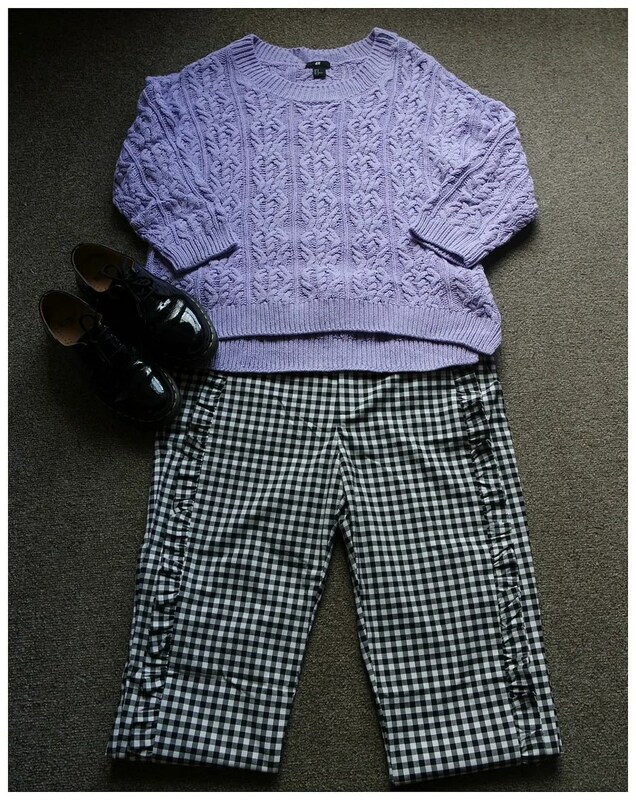 The lavender of the sweater is a nice bright color clash with the ruffle trousers. Super perfect for spring, but especially great for those cooler days. Of course a monochrome look is classy and this also shows you how easy it is to dress up these pants. All you need is a pair of strappy heels and a classy top and you can take these trousers from day to night in an instant. It would be especially fun to pair this look with a neutral makeup look and a neon pink or orange red lip. Another thing I like about this look is how the pants truly take center stage. I love a good red and black combo and if I can clash some prints at the same time then I’m all for it. The stripe of the t-shirt is quite thin, which is why I think it doesn’t overpower the outfit. It also helps that the heart shaped patch on the bust area is also black: that ties in the color quite nicely. Naturally I had to bring back that red on my bottom half. 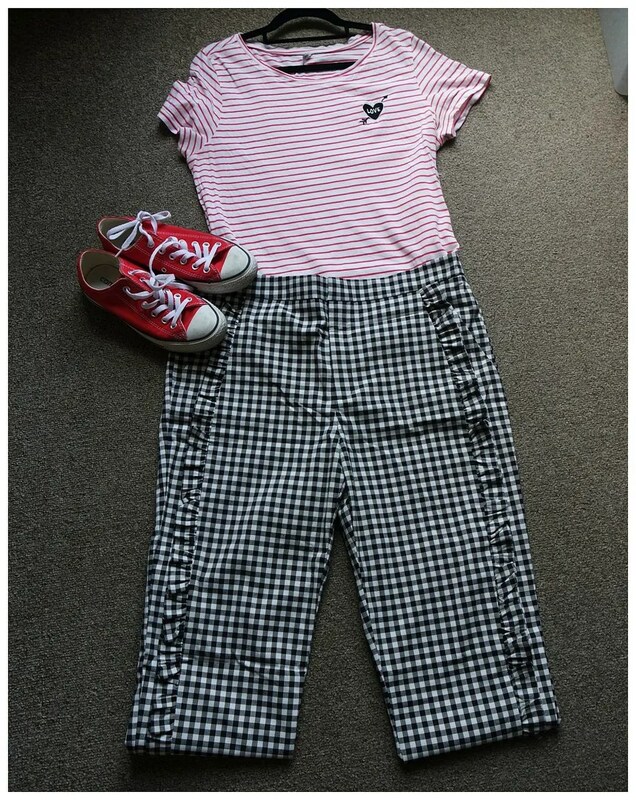 That is why I paired this look with one of my most trusted pair of shoes for the spring time: my red Converse low tops. The next outfit is a more androgynous. You know I like a boyish look! Here I have paired the pants with a khaki blazer in a linen fabric. This keeps the outfit from being too stuffy: the fabric is nice and airy and therefore great for the spring time. I like how the black items form a nice base for this outfit. Combined, this makes the pants and the blazer shine. I think this color scheme is especially flattering if you have blonde hair and fair skin: that olive tone of the jacket will offset those features very nicely. True, forest green is more of a fall/ winter color scheme, but I just like how this outfit works. I love wearing jewel tones and I wear them year round. This cardigan isn’t too thick which keeps you warm, yet doesn’t cause you to overheat. 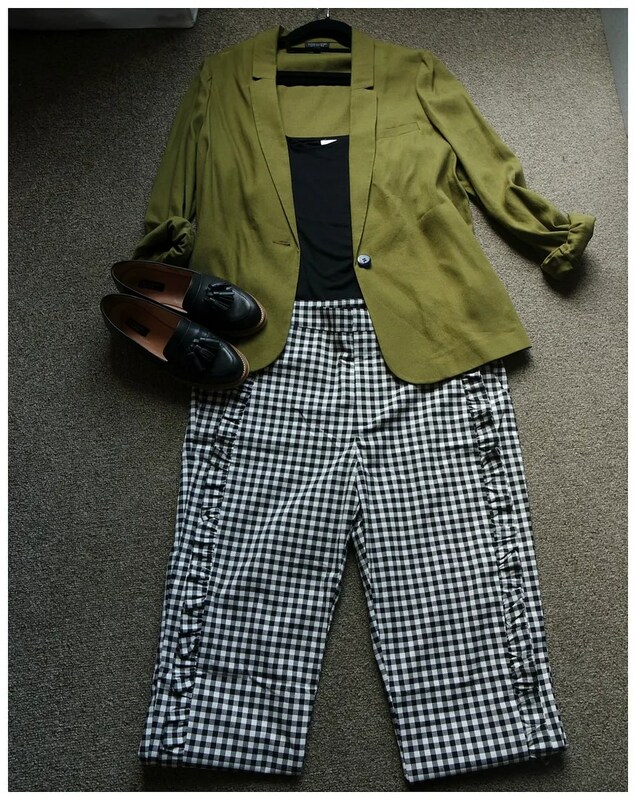 Again, the base of the outfit is black, but to compliment the cardigan I paired this with my forest green brogues. It makes for a darker outfit, but I think it works well with the color scheme and it again makes the trousers stand out more. 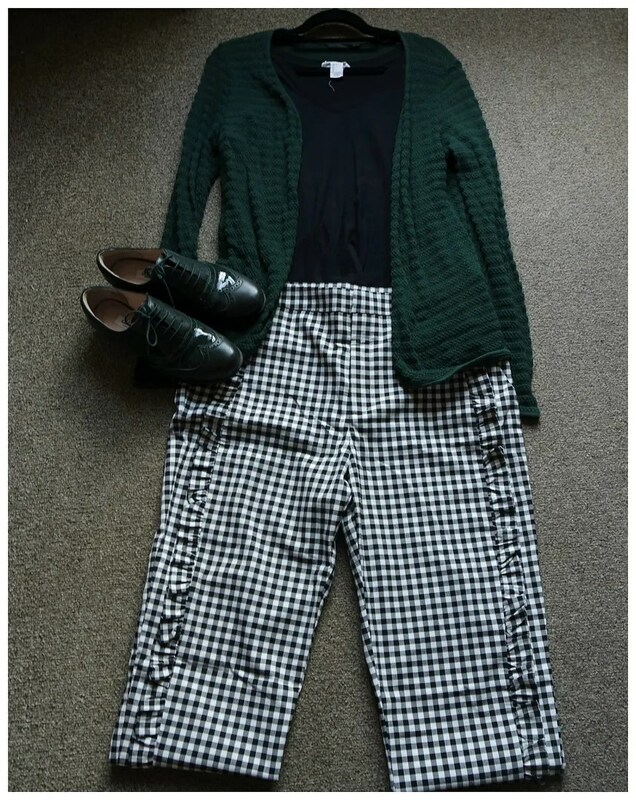 How would you wear gingham trousers? Thanks! They are quite snazzy indeed. Very nice to style similar outfits! Those trousers are great! I like how you styled them differently. I like trying to see how I can style my clothes in different ways. A great way to get more wear out of it. Digging the pattern mixing with the stripes shirt! Very playful! I love mixing patterns. If done well it can make for a cool look.